The Bad Guys next mission? Rescue 10,000 chickens from a high-tech cage farm. But they are up against sizzling lasers, one feisty tarantula, and their very own Mr. Snake...who's also known as The Chicken Swallower. What could possibly go wrong? Get ready to laugh up your lunch wi... read full description below. The Bad Guys next mission? Rescue 10,000 chickens from a high-tech cage farm. But they are up against sizzling lasers, one feisty tarantula, and their very own Mr. Snake...who's also known as The Chicken Swallower. What could possibly go wrong? Get ready to laugh up your lunch with the baddest bunch of do-gooders in town! Aaron Blabey was an actor before he started creating children's books. In 2008, Pearl Barley and Charlie Parsley was awarded Children's Book Council of Australia's Book of the Year. In 2012, The Ghost of Miss Annabel Spoon was named a White Raven by the International Youth Library, Munich, Germany. It also won the Patricia Wrightson Prize in the 2013 New South Wales Premier's Literary Awards, and the Children's Peace Literature Award, 2013. 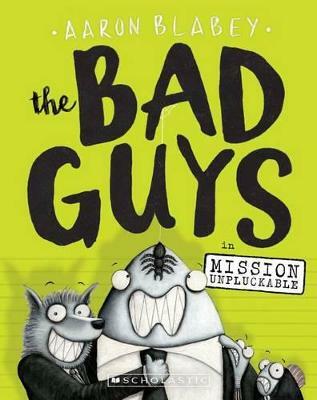 And now The Bad Guys has won Australia's Children's Indie Book Award for 2016! He is also the author of many children's picture books, including the bestselling Pig the Pug series and Thelma the Unicorn. Aaron lives with his two children and his wife in Sydney, Australia.